Three weeks of grueling work is finally over. 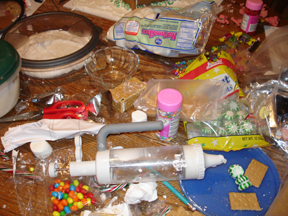 We will now be able to reclaim the kitchen table from mounds of candy, crumbs and icing blobs. Jessica's house features pink siding and golden windows, lit from the inside. 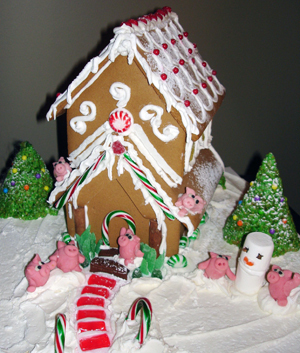 My Gingerbread House of Cats has a dancing feline perched on the roof. The cat consists of a couple styrofoam balls coated in royal icing and covered with brown fondant. Here's the base of the Gingerbread House of Cats. Our "windows" were made from a rock candy recipe, which worked great except for one alarming discovery. The stuff melts! Jessica noticed a sticky brown substance dripping all over the snow and walls. Guess the heat and/or humidity breaks down the homemade windows after a while. Ha! I remember seeing this video last fall while searching for gingerbread house pix. A haka is a traditional dance of the Māori of New Zealand. 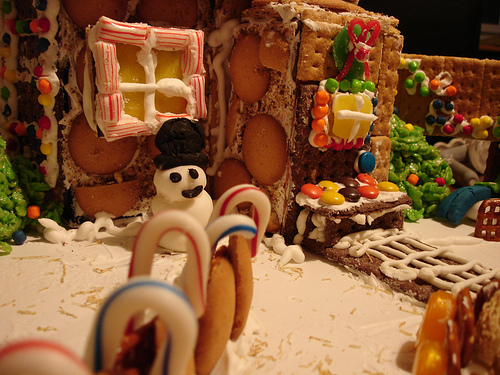 It is a posture dance with shouted accompaniment, performed by a group and in this case, a group of gingerbreadmen. 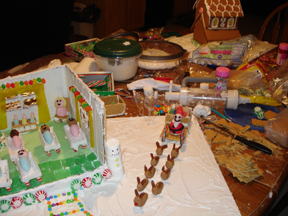 Update: This year's gingerbread entries are well under way, but not yet finished. 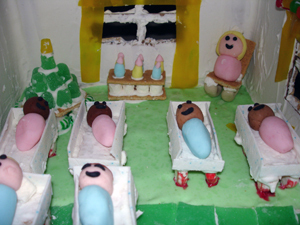 Fondant babies are in the nursery, while Santa and reindeer approach outside. 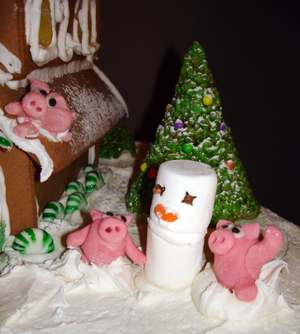 Almond paste pigs lost some legs and tails, but are undergoing repairs for the gingerpig scene. Trees and bushes still need to be fashioned from Rice Krispie treat recipe. Meanwhile, kitchen table is a mess and will remain so for one more week. Watch for more pix. 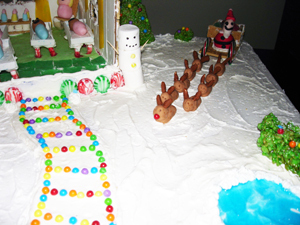 Jessica, my stepdaughter, wins a ribbon in our town's local gingerbread competition every Christmas. Nobody comes close to her creative, unique designs. This holiday season, I'll post some photos so you can see for yourself. 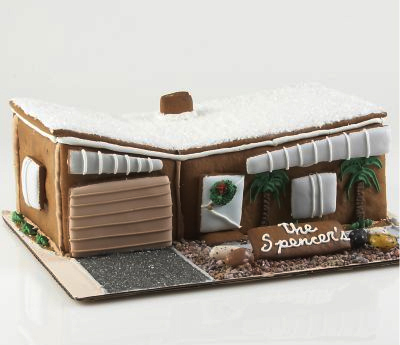 Way beyond the traditional holiday gingerbread house, this retrocool structure is available from red envelope. It's an edible take on the vintage modern deco that many of us experienced years ago, first-hand, and long for again. If you like the real thing, check out Lotta Livin', your ultra guide to "Atomic Age and Mid Century Modern Living." It's filled with current listings across the U.S. along with great photos. As far as royal icing goes, this is my favorite. Grab a can of meringue powder at most any store carrying cake decorating supplies and you'll end up with a great batch of fluffy white stuff. I mention the Wilton brand only because I use it and it works well. I don't work for Wilton! However, I head over to their tent sale in Woodridge, IL every June to load up on super discounted baking supplies. Enter Tent Sale into the search box at Wilton online for details. Beat all ingredients until icing forms peaks (7-10 minutes at low speed with heavy-duty mixer or 10-12 minutes at high speed with hand mixer). Makes 3 cups of icing. Use this icing as the glue for your gingerbread house and accompanying decorations. It dries hard as a rock in just a few hours. Since it includes raw egg whites, don't eat this stuff. Nobody wants Salmonella for Christmas! Beat all ingredients at low speed until icing forms peaks, 7-10 minutes. Cover bowl with a wet towel while you work or (better yet) move directly into an airtight container. Use decorator bags and tips or a cookie press to pipe icing onto your gingerbread masterpiece.